All new JETs go to Tokyo Orientation, where we learn more about the program, our jobs, the Japanese educational system, etc. It was held at the swanky Keio Plaza Hotel. They say many JETs skip out on the workshops to wander around Tokyo, but I went to all of them. There was one I really wanted to skip because I knew it wouldn’t tell me anything new, but, ultimately I went anyway. So, my only chance to go to the one place in Tokyo I really wanted to go to was on arrival day, Sunday the 2nd. It’ll probably sound silly, but the one place I absolutely had to go to was the Square-Enix Show Case. I won’t talk much about it here, since this blog is supposed to be about JET not geeking out, so, yeah. But I was really happy I got to go! During the dinner, I learned that one of my fellow Fukuoka JETs was also a Square-Enix fan. We decided to go to the store, even though it would be closed. I offered to lead the way since I knew how to get there from the hotel. But, there were some… circumstances and we didn’t leave directly from the intersection I knew so…we ended up walking in circles! 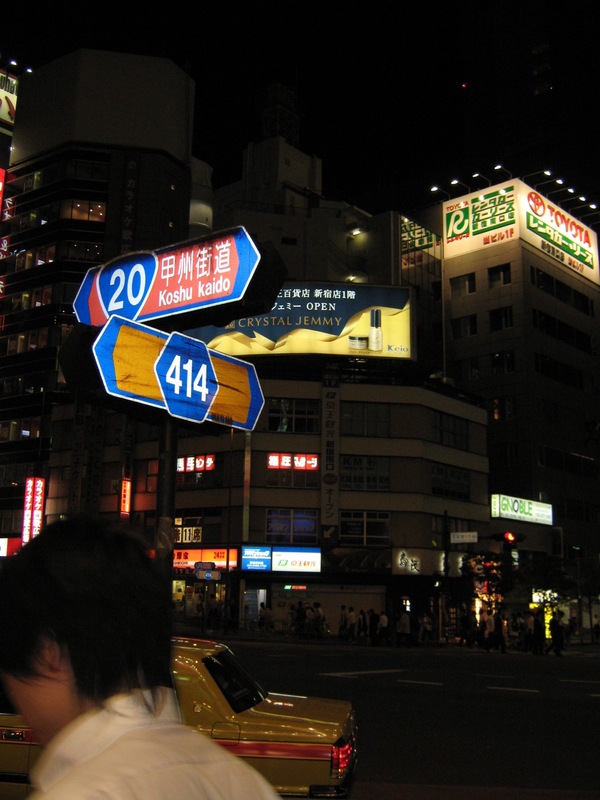 >_< It wasn’t too bad though; at least I got to see more of Shinjuku, which I would not have seen otherwise. On the way we stopped to get “bubble tea,” which is tea with tapioca (the “bubbles” I guess) in it. I think it took us an hour to find the store, even though it should’ve only taken 15 minutes! The next day, everyone went off to their respective prefectures. People close to Tokyo just took trains, but since Fukuoka’s far away on Kyuushuu we flew out of Haneda Airport to Fukuoka. Everyone was greeted at the airport by someone from their Contracting Organization. I was greeted by one of the Vice Principals, my supervisor, and my predecessor. They were all very nice. Both of the gentlemen from the school speak English well, so that made things easy. The four of us had lunch at a Japanese restaurant in the airport. Then, we went to the immigration office since it’s right there in the airport and I got a re-entry permit. My predecessor commented that most people don’t know you can do that (get the re-entry permit right when you first arrive), and that it should be more widely announced. Indeed it should be! While I’ve had difficulty getting other things set up, at least I know that should I need to travel outside of Japan I already have the re-entry permit.